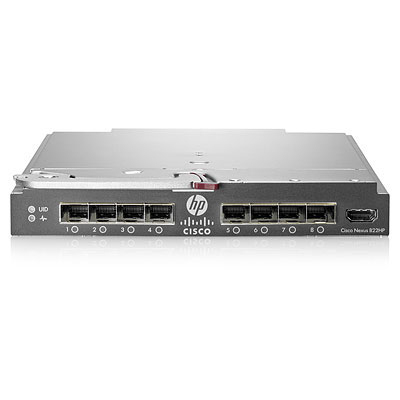 The Cisco Fabric Extender for HP BladeSystem (Model B22HP) provides an extension of the Cisco Nexus switch fabric to the HP server edge. Logically, it behaves like a remote line card to a parent Cisco Nexus 5000 series switch, with the Fabric Extender and the parent Nexus together forming a distributed modular system. The Cisco Fabric Extender for HP BladeSystem forwards traffic to the parent Cisco Nexus switch over eight 10 Gigabit Ethernet uplinks. Downlinks to each server are auto-negotiating and work with all HP Ethernet and CNA modules allowing a choice of Ethernet, FCoE or iSCSI connections. Passing all traffic seamlessly to the Nexus 5000 allows traffic to be shaped according to policies established by the Nexus 5000 Series Switch with a single point of management.